Conveniently located in the vibrant entertainment and shopping district of Orchard Road, the Pan Pacific Orchard is only a 5-minute walk to the Orchard MRT Station and a 20-min drive from Changi International Airport. mail, coffee/tea making facilities, hair dryer, mini bar, refrigerator and safety box. Leisure facilities on site include outdoor mineral water swimming pool, Jacuzzi, sauna, steam bath, spa and fitness centre. Other services include 24-hour room service, currency exchange, limousine service, express check in/out, laundry, dry-cleaning and butler service. two restaurants and six meeting rooms which can accommodate up to 150 guests. The hotel's Pacific Club offers extra accommodation and exclusive privileges to discerning business travellers. The benefits include: complimentary breakfast, all day refreshments and snacks,pre-dinner cocktails, complimentary internet access, complimentary local calls, dedicated butler service, and access to the cosy and exclusive Pacific Club Lounge. Located along Claymore Road, which is a slip road off Orchard Road, the main shopping and Entertainment hub. Most of the main shopping centers, including the Duty Free Shop (DFS) along the famous Orchard Road are a mere 5 minutes walk. Orchard MRT station is an 8 minute walk away.10 at Claymore. House of Peranakan Cuisine. Lobby Lounge.Premier room is 35 sq.m.,offers 1 Double Bed or 2 Single Beds.Premium rooms combine elegant décor with personal touches ? a home away from home for busy travellers. Stylishly designed to evoke the warmth and tranquility of the Pacific, these rooms are equipped with all the modern conveniences to match including bathrooms with separate long bath and shower stall. 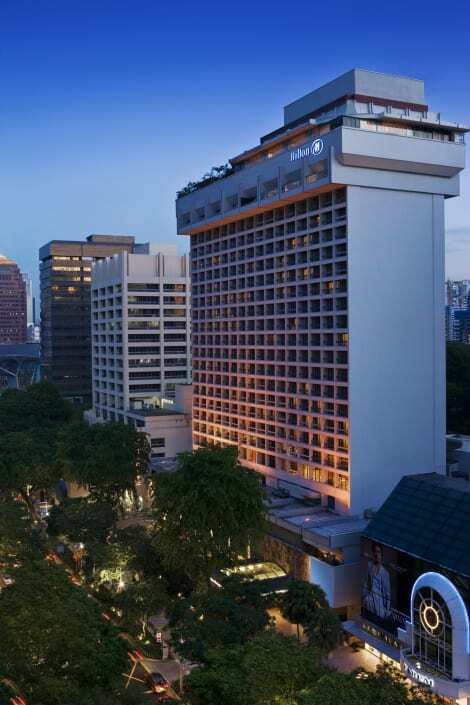 Situated in the heart of Orchard Road, Singapore's popular entertainment and shopping district, the Hilton Singapore hotel is close to both ION Orchard and Takashimaya shopping centers. This Singapore hotel is a convenient 20-minute drive from Singapore Changi International Airport and close to Singapore's popular attractions.Dine at il Cielo Italian restaurant and bar to savor authentic Italian cuisine prepared with natural and organic produce, as you enjoy panoramic views of the city skyline. Indulge in a Sunday Brunch at Checkers Brasserie or unwind with a nightcap and some late night jazz at Kaspia Bar. Revitalize with an organic juice and healthy lunch from the Glow Juice Bar and Café. Enjoy shopping in luxury boutiques without having to leave the hotel in the Shopping Gallery.Stay active during your stay at this Singapore hotel. Swim laps in the rooftop pool, work out in the fully equipped fitness center or indulge in rejuvenating beauty treatments.Make business easy at the Hilton Singapore hotel. Stay connected with colleagues and catch up with work in the business center equipped with contemporary business amenities and secretarial services. Hold business meetings or conferences in our versatile meeting rooms accommodating 18-550 guests. With a stay at Shangri-La Hotel, Singapore, you'll be centrally located in Singapore, a 1-minute drive from Orchard Road and 10 minutes from Singapore Botanic Gardens. 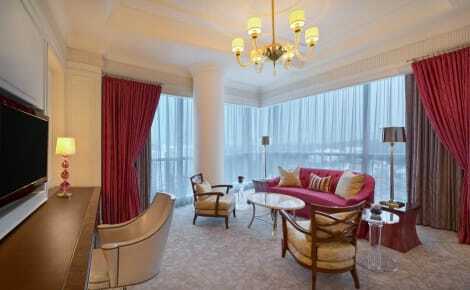 This 5-star hotel is 3.2 mi (5.1 km) from Singapore Flyer and 3.3 mi (5.3 km) from Raffles Place. With a stay at The St. Regis Singapore, you'll be centrally located in Singapore, steps from Orchard Road and 10 minutes by foot from Gleneagles Hospital. This 5-star hotel is 2.4 mi (3.8 km) from Bugis Street Shopping District and 2.6 mi (4.2 km) from Singapore Botanic Gardens.